Using a step-by-step approach, this book focuses on how the average home user can convert their existing home movies to a digital medium. As DVDs become even more common, the market for transferring VHS movies to DVD is going to soar. 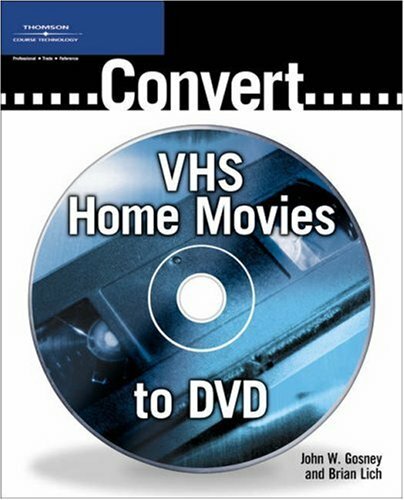 This book seeks the "ease of use" appeal of the DVD/VCR by applying it to the typical home computer, and to allow "mass market" readers to not think twice about using their computer to extend the capabilities of their DVD. It recognizes the distinction between a computer as a consumer product versus the ease of use of a typical home appliance, such as a VCR or DVD player, and tries to bridge that gap. Put simply, the goal of the book, then, is on the newly-created DVD: the computer is only the mechanism at which to arrive at this goal. It assists readers in conducting an inventory of their existing hardware (Does their computer have a DVD burner What video editing software might already be included on their computer), and serves as a guide to their purchase of any required equipment (external conversion device, external DVD burner, etc.). This book skillfully guides readers from the beginning step to the final step of bringing their "VHS memories" into the digital age-knowledge that is going to become more and more crucial for the average home VHS/DVD owner seeking to save their dust-filled tapes without having to pay others to do it.